The history of the Rotary Club of Culpeper is so closely related to that of Rotary International that one must travel to the rapidly growing pioneer city of Chicago shortly after the turn of the previous century where the lonesomeness of a young lawyer in a strange city was responsible for the formation of the first of the present-day civic organizations. This lawyer, Paul F. Harris, sold to a few of his business friends the idea of a new group or club in which a representative number of businessmen would meet periodically to become better acquainted. Frank W. Evans (Norfolk, Virginia), left, presents the club charter to P. Winfree Fore on March 7, 1927 in the dance hall of the Fair Grounds Inn. Two hundred and seventy people, mainly Rotarians and their spouses from Culpeper, Charlottesville, Front Royal, Winchester, Warrenton, Fredericksburg and Richmond, attended the banquet. Entertainment included a demonstration of the latest dance craze, "The Black Bottom". 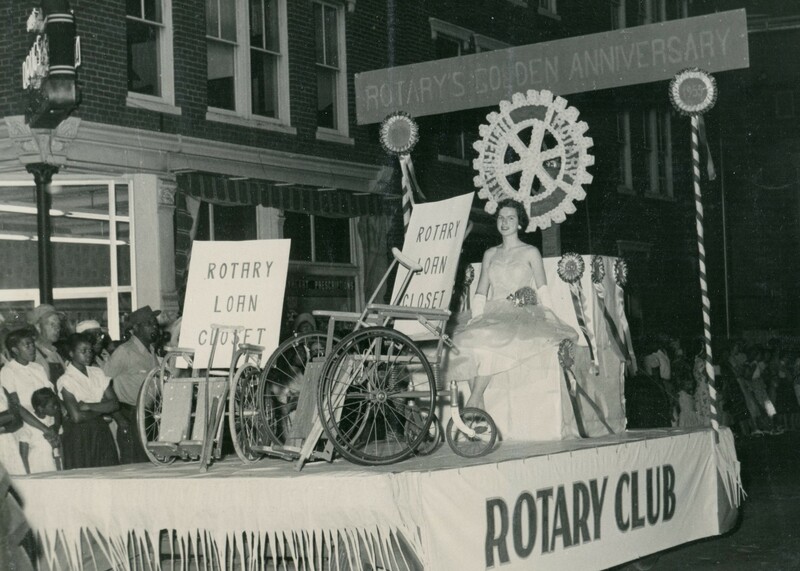 In December of 1926, "Van" Van Emon, representing the Charlottesville Rotary Club, came to Culpeper to organize our club. 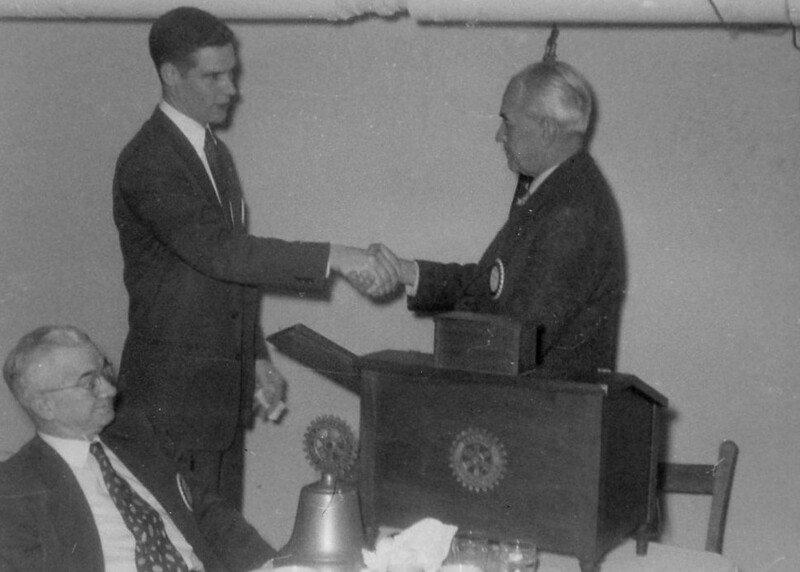 On March 7, 1927, the Rotary Club of Culpeper was organized at the Fairgrounds Inn by William Surber, President of the Charlottesville Rotary Club. Frank W. Evans, District Governor at the time, presented charter #2472 to the seventeen charter members of the Rotary Club of Culpeper. P. Winfree Fore was elected president, Cornelius S. Bruce, vice-president, Robert Y. Button, secretary and R. Maxwell Willis, treasurer. H. G. Stephens, Rehabilitation Adm.
Our club has the distinction and honor of being the second oldest club in District 7610 trailing on Charlottesville, our founding club. The Rotary Club of Culpeper continues in service to our community and in fellowship after more than 80 years. Club float in a 1955 Culpeper parade. The float commemorates the 50th Anniversary of the Founding of Rotary International and promotes the local club's Loan Closet. The Loan Closet was a program which loaned wheelchairs, crutches, hospital beds and other medical supplies to needy residents in the Culpeper area. We have had the distinction and honor throughout our history to have had three generations of the Yowells (John, Jack and Billy) and the Hurts (Jim, Weter and Hobson) serve as Presidents of our club. We also have had two generations of the Shumans (Don and Chris), the Fores (P. Winfree and P. Winfree, Jr.) and the Stringfellows (Lawrence and Charles) serve as Presidents of our club. The history of our club now spans generations with some of the founding members' children and grandchildren serving within our club. We have been honored to have one member Claude "Snort" Huffman who had perfect attendance for over 50 years. Mr. Huffman continued to attend meetings until his health prevented him from coming and being active. After the end of World War II, the club's members sent a hand-written letter to Winston Churchill thanking him for his part in leading the war effort in England.